>> Camping in the Rain: How to Set Up a Tent Comfortably? If you are an adventurer and you like to camp outside, laying in front of the bare sky, and getting a bath from the moonlight, then you must have come across this certain situation where it starts to rain. What now? You do not need to worry at all. Instead of panicking and losing hold of your nerves, why not make the most out of it and enjoy this drizzle or even the heavy rain like cats and dogs while you are out there. If you have prepared to tackle with rain then instead of being an interruption your way, raining can change your experience to something enjoyable and have something different for a change. 5. how to make the most of the trip while you are at it. All the above-mentioned queries along with what you need to be avoiding or, what can be the buzz killers on these expeditions of yours – we are going to discuss each of these in detail. The most crucial part of your whole experience is finding a suitable spot to camp because the rest of your steps are going to be based on this step. All the famous adventurers and campers recommend that you find a space at a relatively higher altitude. You do not need to go all the way to the top, but you should be avoiding the lowest spot, why? Because if it’s raining already and you set up at a lower spot, then water will eventually flow from higher spots to there. And, waking up in water about a foot up your tent isn’t funny! Next thing you should be avoiding is camping near a puddle or lake because it will do the same thing and you want to avoid a flood too. The last thing to look for is not to camp directly under the trees for two reasons, one that even after the rain stops, water keeps dripping from the trees. Secondly, if the rain gets too heavy then a branch or two might snap, and that can be dangerous at times, and you do not want to be on the receiving end of that. Right? So, in short camp at a place where there are lesser trees, a fairly high altitude, away from lakes or ponds and that will do you the trick. The next thing that you need to do is setting up a fire. Because you can catch a cold and that’s the last thing you want on an adventure. To set up a fire, you need to have waterproof matches packed with you, the next thing you want is tinder. Firewood is something that quickly catches up the fire but does not burn that long; it’s just to start a fire because your fuel does not burn directly in this moist environment. The best thing you can use as tinder is pine cone that is usually lying around pine trees. But, if you do not have access to pine trees, then you can make up your own tinder by randomly choosing a twig or branch and peeling the wet surface from it with a knife. Once you have the tinder and the waterproof matches, then you are almost set up for a fire. Just place your fuel, place the tinder over it, and burn it. Most probably you will get a good fire going. During all this process your clothes are expected to get wet along with your camping gear. You cannot continue with your agenda if your clothes are dripping wet and most of your gear is soaking. So, you need to get them dry ASAP. Now, this can be a tricky part, how to dry your gear in the rain? You can either set up a tarp shelter by simply attaching strings to the trees around and putting a tarp over these suspended strings. Once you have set up a shelter, then you can suspend a rope the same way near the fire that you set up earlier. It will help you get your gear and clothes dry and back to their optimal performance. If you want to avoid the trouble of drying your stuff and the clothing you packed, then you should pack your stuff in a waterproof bag. In case you are running low on budget, you can simply buy a rainproof bag. It's not something that it sounds like. It's actually a plastic bag type thing made of parachute material that goes over any bag and protects it from getting wet. Similarly, you can either get waterproof stuff sack or again if you do not have a lot of money then you can go with the rainproof bag and put it over your standard stuff sack, and you are good to go. Once you have found a suitable spot to spend your night, you have a tarp shelter, and that’s a plus point. Not necessarily but if you have a tarp shelter, a fire going on, dry gearsat their best, then you are left with only one thing that is setting up the tent. Setting a tent up in the rain is no different then in dry conditions if you have found a suitable spot. Just lay out a tarp on the ground, get all your components of the tent on the ground, lay your tent on top of the tarp and get out your tent poles. Connect the tent poles with the tent, raise up your tent and skate your tent to the ground. This can be a tricky part because the ground is all soft and slippery because of the raining. So, find a spot which is relatively dry and hammer down the stakes into the ground. You are good with the tent. 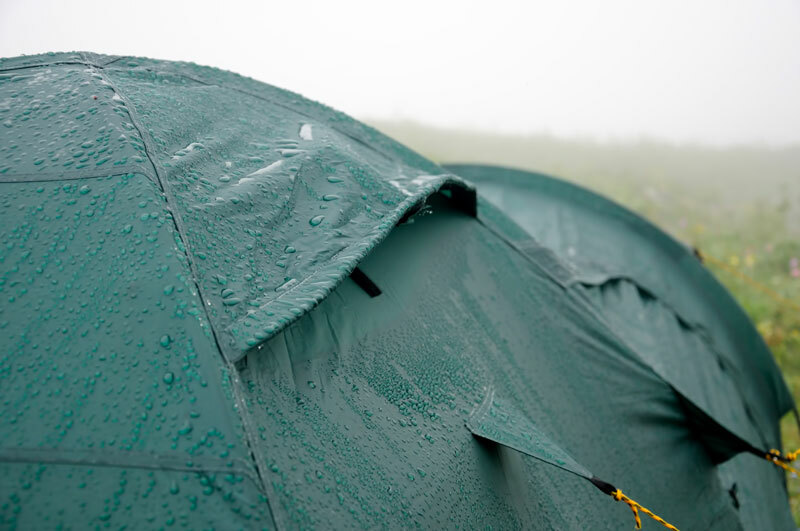 It’s better to put a rain cover over your tent because if you do not have a tarp shelter or even if you have a tarp shelter, then it’s not necessary that it will keep your tent dry from all the sides. What are the things that you should always have whether it’s raining or not? Firstly, you should pack a Bivy sleeping bag. It has an extra layer of insulation, and it helps you stay warm no matter how harsh the cold is outside. Keeping stuff like waterproof bags, waterproof matches, hunting knife, hammers, strings, ropes, camping hatchet, extra tent poles, backpack rain trap or the parachute stuff to put over your bags and gear, survival and first aid kit and dry tinder is literally a lifesaver. And if you have all the above-mentioned gear packed, then you won’t be having a problem whether the weather is dry or extremely wet. Once you are all comfy in your tent under the tarp shelter, fire going on, clothes and gear all dry, then you might feel hungry after going all through the troubles. A cup of hot cocoa or the instant recipes that you have been learning all your life would be helpful at this time. Secondly, if you have a Bivy sleeping bag with you, then you can preheat your food in the bag because it can be hard to cook in moist and wet weather conditions. Sitting under the shelter with a warm cup of coffee and listening to the raindrops along with the thunder once in a while with the sweet smell of the moist mud, what can be more dramatic and ideal than that? If you have made this far to the end of the article, then you are already familiar with tackling the rain and making up the most of the trip. All you are left with at this point is how to choose your suitable clothing. Which clothes should you pack and which ones you should leave back home, how to keep your clothes dry? First of all, you should pack a lot of fleece layers. Fleece is relatively cheap but it’s not the only perk that it comes with, its light in weight, keeps you warm and dry. But the problem with fleece is that it gets wet due to the rain, and if the wind is too harsh, it cuts right through the fleece. Over the fleece layer, you should have a wool layer, that can be a sweater or a jacket whatever you are comfortable with or more importantly, what you own and do not have to buy. The wool layer over the fleece layer helps you avoid the soul-shattering wind pass through you. You can have more than one wool layers depending upon your metabolism and how your body responds to cold. But there’s one more layer that is a must over the wool layer. Yeah, it’s the waterproof jacket and the waterproof trousers. If you don’t bring these two items with you, then it does not matter how much layers of clothes you pack, you are going to end up wet with all the layers soaking with water. Wear bright colors like red, orange, or yellow that makes you easier to locate and even if you are lost you can be easily found. Have hand warmers inside your gloves and get a few of them in your shoes also. Keep the first aid ready, and the hunting knife and survival kit with you when you set to roam around. Pack gaiters with you because even if the rain stops, the morning dew can mess up your clothes. Wrapping up, this is all you need to know if you are planning to set out on a trip and it is expected to rain. Pack the gear well, pack the clothing well, and bring the rain bags! You are surely going to go through a great camping experience.